The ACCC received an unqualified audit report on the 2016–17 financial statements from the Australian National Audit Office. These statements can be found in part 5 from page 241–284. The agency reduced its operating deficit to $1.7 million excluding depreciation and amortisation in 2016–17 compared to a $5.5 million deficit in 2015–16. The ACCC’s net cost of services for 2016–17 was $180.6 million (2015–16: 176.4 million), with revenue from Government of $173.4 million (2015–16: 165.3 million). Revenues from other sources were lower in 2016–17 by $1.4 million or 25 per cent. 2015–16 included one-off project funding to conduct a gas inquiry resulting in the decrease in 2016–17. In 2016–17, expenditure on ACCC activities increased by $2.9 million. This mainly relates to an increase in legal settlements of $4.7 million and an increase in contractors and consulting of $5.2 million offset by a decrease in legal expenses of $6 million and a decrease in salaries and wages of $0.8 million. A comparison of revenue and expenditure trends over the last four years is illustrated in figure 1 below. Key financial results for ACCC for the financial years 2014–15 to 2016–17 are shown in table 1.1. The ACCC is a knowledge-based organisation and as such spends approximately 56 per cent of total expenditure on employee costs (2015–16: 57 per cent). Legal expenditure is subject to volatility depending on the timing and outcome of litigation proceedings. Legal expenditure decreased by $5.9 million or 22 per cent in 2016–17, compared to 2015–16. Other expenses (excluding depreciation and amortisation) increased by $9.8 million or 21 per cent in 2016–17. This is primarily due to an increase in legal settlements of $4.7 million and an increase in consultancy and contractor expenses of $5.2 million. 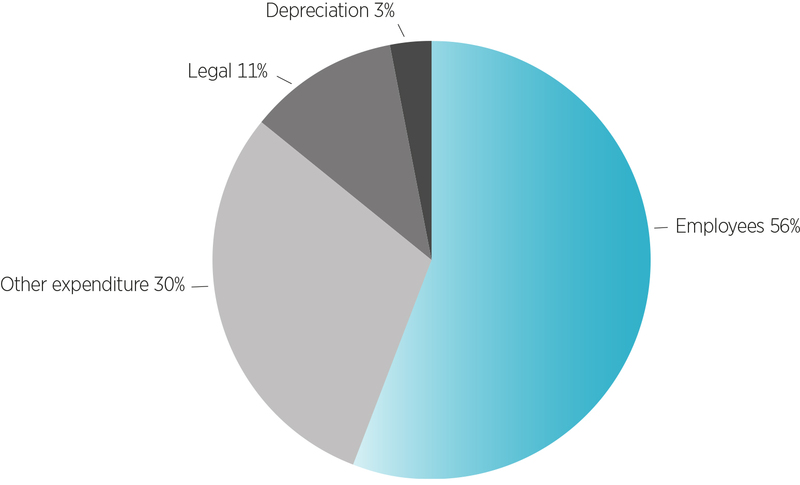 Depreciation and amortisation has remained relatively consistent over the same period. The ACCC recorded a comprehensive operating loss for 2016–17 of $7.1 million, as compared to an operating loss of $11.1 million in 2015–16. The decrease is largely due to an increase in revenue from government. The reported operating loss was a result of $8.9 million in expenses for court costs awarded against the ACCC during 2016–17. The ACCC receives an operating budget of $1 million per annum for court cost expenses incurred. The ACCC’s net assets as at 30 June 2017 totalled ($8.5) million as compared to ($4.7) million in 2015–16. Total assets as at 30 June 2017 were valued at $50.9 million compared to $54.5 million on 30 June 2016, representing a 6.6 per cent decrease. This decrease largely relates to a reduction in appropriation receivable consistent with the increase in legal settlements for the year. Total liabilities remained relatively consistent at $59.4 million compared to $59.2 million in 2015–16. In 2016–17 the ACCC received $46.7 million in administered revenue representing a decrease of $37.2 million from 2015–16. This amount includes court-imposed fines and costs.